To begin with, prior to bringing my CV to the coffee shop, I had experience of working in the hospitality sector; kitchen porter, food runner, waiter, bartender, commis chef, chef de partie in Holland, the UK and Spain. Hence, I knew that I could find a similar type of job in this industry and that is why I brought my CV to Starbucks during Freshers’ week. Subsequently, within a few days I got an email inviting me for a trial shift. During the trial, I will be honest, I was a bit stressed but I think that overall that helped me to work better and show my best capabilities. It was a one hour shift where I was mainly assigned to put food in the oven and deliver it to customers. It was not a difficult task and the team alongside the manager made me feel very comfortable from the get go. Afterwards, I was told to wait for a few days to receive an answer whether I had the job or not. In the end, I received a confirmation email stating that I am an official Starbucks employee! Now I’ve been working there for almost six months and can reflect on my experience so far. Overall, although I do not work as many hours as expected, I really am enjoying my time as a “baby barista”. Firstly, I really like my team and surrounding people, everyone is very friendly and helpful when it comes to a collaborative customer service delivery. 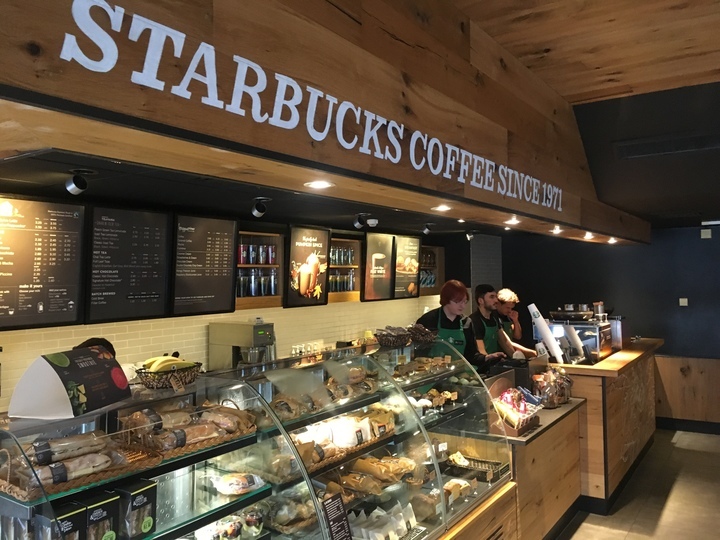 Secondly, many could say that this Starbucks is right at the centre of campus and the heart of the student community as it serves thousands of students and staff members coming to get their morning cafe latte prior to starting lectures. Because of that, you can meet and interact with so many different people and really feel what the Surrey community is like, which you would not be able to experience if you were just to interact with your course mates or a group of friends. Lastly, I truly love coffee and it is amazing to make people happy with something that makes you happy as well if that makes sense… Passion for coffee is essential if you were to work in such a place. Oh and I haven’t mentioned yet about occasional socials that we do from time-to-time to build our team spirit. With sadness, I probably will have to leave this job once I graduate this year and start looking for opportunities out there in “the real-world”, but I would definitely recommend to fellow students considering a paid part-time job to bring their CV to the heart of Surrey University.